It’s All about me. Well, at least today’s post is. 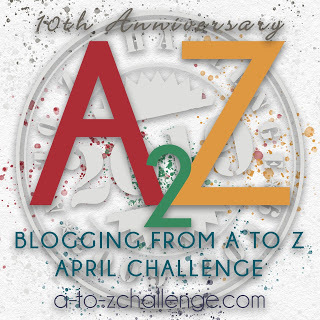 I have been participating in the A2Z challenge since 2012. With the exception of last year, I was able to complete the challenge each year. The challenge takes time, thought, and a committed dedication. I started my blog on March 10, 2011. My 34 year old son had been diagnosed with stage IV colon cancer in January of that year. Someone suggested to me that writing about my feelings might be a helpful way to cope with what lay ahead. That person was right. There were times I was able to overtly express feelings of unimaginable pain. Other times the feelings were enigmatically expressed through a fictional character. With each new post, I slowly began to realize that I actually liked to write. It was surprising to me how easily the words flowed. I have since come to understand that although inspiration and passion can make words flow easily onto the page, not writing regularly can dull the quill. As my blog ages, it is glaringly obvious to me that I am writing much less. Which brings me back to why I participate in this challenge, simply to sharpen the quill. My theme this year will be spirit. Yes, “As the spirit moves me”. You will get to know me. Perhaps those enigmatic fictional characters will be special guest bloggers from time to time. I hope to get reacquainted with old friends and perhaps find a new friend or two. So this is my A post. I am off to a good start, wouldn’t you say? I'd say you were off to a good start indeed. Yea, you're back! Welcome back. Glad I found your blog...so sorry to hear about your son. Too many people fighting cancer lately. Off to read more of your A-Z posts. Hi Donna, Nice to meet you too :) Thank for your kind words.